The Tragic Crude Oil Theft! "Anglo Dutch oil giant, Shell, lost about $1.6 billion dollars to theft and other disruption to its Nigerian oil and liquefied natural gas (LNG) operations in 2013. The company, also, noted that oil theft, which has witnessed an almost magical increase in recent times, is costing Nigeria even more. The theft is very material,” Simon Henry, Shell’s Chief Financial Officer, said on a conference call”. A passenger boat operator at Nembe waterside, Yebiri Alexander, says “Unto to thy hands oh Lord, we commit our resources”, Niger Delta’s dream of peace, but are plague by hostilities, they cherished law and order, but cannot stem the tide of insecurity, open fraud. They had to trust their neighbour, but have to lock their doors for protection. In the name of protecting and securing Nigeria and Multinational’s oil installations and facilities, maintaining law and order in the troubled Niger Delta Region of Nigeria. This is why the Joint Task Force [JTF] was established, but has this outfit lived up to it’s billings? Welcome to Niger Delta, ‘Where the sun never sets’ ‘The Pride of the Nation’ ‘The Treasure Base of the Nation’ ‘The Big Heart’ ‘Finger of God’, regal in aquatic splendour, once consume by the Niger Delta militants and now being eaten by the termites called the joint Task Force [JTF] ‘Operation Pulo Shield’. A onetime outgoing Commander of the Joint Task Force [JTF] Operation ‘Pulo Shield’ operating in the Niger Delta, Major General Johnson Ochoga, admitted that some of its personnel were corrupt. “There’s no organization that will say it is 100 per cent clean [from corruption]; so also is with the Joint Task Force ‘Operation Pulo Shield’. ‘ll not say we don’t have bad eggs; but to those soldiers [involved in corruption]; every day is for the thief and one day is for the owner”. Borokiri, and in Warri. And, despite several helipads that dots the entire Niger Delta, Bonny River Channel and the Atlantic Ocean across to Eket and Warri for easy overfly and aerial view of the Atlantic Ocean complimented with the Nigerian Navy patrol boats, nobody could stem this tide! Shell Petroleum Development Company [SPDC] loses about 60,000 barrels of crude oil per day, while Nigeria National Petroleum Corporation [NNPC], loses about 80,000 barrels of crude per day. ‘Operation Pulo Shield’ doing? With only five openings channels to Bonny River Channel and the Atlantic Ocean, JTF ‘Operation Pulo Shield’ could not stop this ‘Ring’. Crude oil thefts is part of the Nigeria societal decay, that has cost Nigeria’s government a colossal $7 billion dollars [1.2 trillion naira], everybody is complaining, with a hovering loss of about 140,000 barrels per day. It is indeed disheartening. Nigeria has asked Britain Defence for help to tackle the mufti-billion dollar oil theft business which is run by international crime syndicates and sophisticated ring’, robbing Nigeria of its resources. In Nembe creeks, Bayelsa State, Krakrama and Awoba in Kalabari axis of Rivers State, as well as areas close to coastal Bonny, also in Rivers State and other parts of the Niger Delta, the illegal pipelines vandalizing and oil thieves are having a field day. President Goodluck Jonathan has revealed that the Federal Government has earmarked one billion U.S Dollars for the implementation of a comprehensive programme to check crude oil theft, the vandalism of oil and gas infrastructure, and the apprehension and prosecution of crude oil thieves. “Oil theft is an aspect of global terrorism, which has become a big industry on its own. It has become a major threat to the Nigerian economy and we need to work with all stakeholders to curb it. The thieves must be traced, apprehended and prosecuted”, the President said. Shell Petroleum Development Company [SPDC] had shut down the 28-degrees Trans Niger Pipeline [TNP] to remove crude oil theft connections, and had closed the 24-degrees Trans Niger Pipeline [TNP] at Bodo West in Ogoniland operated by Shell Petroleum Development Company [SPDC], thereby deferring 150,000 barrels of crude oil production in June 2013, another sad reminder of the tragic consequences of crude oil theft in Nigeria, according to Shell Petroleum Development Company [SPDC], Managing Director/Chief Executive Officer; Mr, Mutiu Sunmonu. The Joint [Military] Task Force in the Niger Delta, Operation Pulo Shield, says the outfit has between January and February 2014 destroyed 308 illegal refineries in the region according to the outgoing Commander, Joint Task Force ‘Operation Pulo Shield’ [JTF], Major General Iliyasu Abbah. Oil thefts in Niger Delta is on the rising scale the highest in the past three years NEVER BEFORE SEEN! And JTF ‘Operation Pulo Shield’ looks the other way! Many oil thieves had being arrested and charged according to Joint Task Force ‘Operation ‘Pulo Shield’ spokesman; Col Onyeama Nwachukwu, but the question is; how many of the alleged caught oil thieves had being charged and sentenced? To some, those arrested are merely minors who operated in dug-out canoes. The large ocean going barges and vessels thieves are so powerful, well connected and wealthy and simply above the law! As President of Ghana, John Evans Atta Mills turned the wheel to officially lunched Ghana into the family of African oil producers, Ghanaian at home and abroad were overwhelmed with joy. Ghanaian friends, well wishers and oil companies were elated. It was a day that will be etched in the annals of the country’s history. President John Evans Atta Mills joined with other former presidents of Ghana - Jerry John Rawlings and John Agyekum Kufuor together with other dignitaries were on the board of the Floating Production Storage and Offloading (FPSO) Kwame Nkrumah vessel. On the vessel, President John Evans Atta promised his country men and women that they will not be victim of oil curse but rather oil will be a blessing to develop their country. On the former presidents of Ghana, President Mills gave great compliments on their vision and fortitude on making oil search and discovery possible. On Jerry Rawlings, he said, "oil exploration was greatly intensified and requisite infrastructure and legislation were put in place," while on John Kufuor, President Mills continued, "It was during his stewardship that oil was struck in commercial quantity." 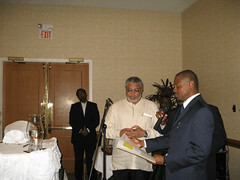 The former President of Ghana, Jerry Rawlings receiving Afripol Achievement Award from Afripol's Emeka Chiakwelu. Tullow Oil, an exploration firm in 2007 made the crude oil discovery at Jubilee Field and Kosmos Energy confirmed the discovery at Odum-2 appraisal well offshore Ghana . Both Tullow and Kosmos Energy are stakeholders of the oil wells at 22.8 and 30.8 per cent respectively. The well is about 4km northeast of the Odum-1 well, which lies approximately 18km east of Kosmos' Mahogany-1 exploration well and the Jubilee oil field. When oil was discovered in Ghana, the former president of Ghana, John Agyekum Kufuor proclaimed that “Ghana will fly” with the discovery and subsequent oil production. Kufuor implied that with the new found oil wealth, Ghana will develop and make life better for its citizen. Without being pessimistic, friends of Ghana desire greatly for Ghana to succeed and to show to the whole world that Africans can also be good managers of oil wealth. Many nations including Norway, Britain and other oil producing nations do not have monopoly on sound oil management and accountability, Ghana can do it too. But it is easier to point fingers to other African oil producing countries, principally Nigeria and Angola, calling them corrupt and insincere for mismanaging their oil wealth. Without doubt these two largest oil producing nations were vulnerable due to paucity of strategic planning and lethargy. The resources they generated from oil exports were not prudently managed and invested for the greater good of their respective countries. Ghana can do better and prove to the world that Ghana can avert the so-called oil curse. Ghana must be precautious, careful and not overconfidence. No country chooses to be corrupt, but when they failed to set up the civil and social infrastructures to curb and control corruption they may end up become a victim of corruption and lassitude. Ghana needs strategic planning, transparency and accountability to avoid making the mistakes that comes with steady flow of revenues from oil export. Ghana does not necessarily need perfect individuals to manage their oil wealth but laws, social and civil infrastructures rooted in transparency and accountability to avoid mismanagement. By this the Ghana National Oil company and the government will not hide anything from their citizens. No gimmicks and tricks in the name of national security to keep away the eyes of the people from not knowing the daily transactions by classifying records, data and in formations. The government should allow the people to have access to the information. The government can set up a website that shows the records of daily amount of crude lifted and total revenues derived from daily transactions. The government of Ghana with the approval of the House of the legislature will nominate intelligent men and women from all walks of life from market women to seasoned business individuals and bureaucrats. These people will be empowered to come up with ideas on how to invest and utilize the oil wealth. The recommendations they give will be approved by the national House and signed into law by the president. Ghana does not need saints and perfect individuals to run the oil wealth. Ghana needs strong and implementable laws on the book to checkmate corruption and increase accountability. The laws must be enforceable which become check and balance on the system. The laws must have teeth and no individuals will be above the law. A law is necessary to prohibit kick backs and bribery from oil companies and transnational corporations. Local media in Ghana and Africa must rise to the challenge and report news without seeking approval from the ‘big’ men of Ghana. The media must be willing to go the extra mile with investigative journalism and keep the people fully informed with the latest developments. Media is the peoples’ last resort to know what the governing class is up to and when the media fails to do the job, it spells a bad omen to a nation. Ghana may eventually decide to open a sovereign fund to enable the country to invest in international markets with high appreciative returns. 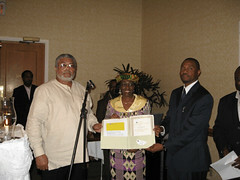 The strategic planners will run the fund together with country’s president and the finance minister of Ghana. Economic diversification is necessary for economic growth and stability. Ghana will not want to suffer the fate of many oil producing countries that focus only on oil at the expense of other sectors of the economy. This is the time for Ghana to invest in agriculture and social infrastructures that will enable the country ‘to fly’ and soars without falling down. Oil’s Shame in Africa: In Nigeria, spills are weekly events. It was hard to believe BP when it announced oil had stopped gushing into the Gulf of Mexico on Thursday, July 15. It had taken 87 days. There was relief but little jubilation: it will take many years to clean the shores and the birds, and for the sea to begin to repair itself from the onslaught of poisonous oil. Surely we can no longer call it a "spill"—it seems too light and trite a word. What’s even more troubling is that in Nigeria, the country that has arguably suffered most from oil drilling, oil "accidents"—large and small—occur almost weekly, and we hear little about it. A lethal combination of sloppiness, corruption, weak regulation, and lack of accountability has meant that each year since the 1960s, there has been a spill the size of the Exxon Valdez’s into the Niger Delta. Large purple slicks cover once fertile fields, and rivers are clogged with oil leaked decades ago. It has been called the "black tide": a stain of thick, gooey oil that has oozed over vast tracts of land and poisoned the air for millions of Africans. In some areas fish and birds have disappeared: the swamps are silent. Americans consume a quarter of the world’s oil—and 10 percent of the oil we consume comes from Nigeria. Why are we not worried and angry about this? Or at least demanding global accountability from companies we support? Especially now that we can see how destructive it is for those who depend on the sea for their livelihood, how foul the impact is, and how devastating the results of poor decisions and ill-equipped response teams are. Many Nigerians watched, amazed, as Americans berated BP for the Deepwater Horizon spill, then saw progress: our president visited the site and demanded immediate action and compensation. Not so in Africa. According to a group of independent experts, between 9 million and 13 million barrels of oil have been spilled in the Niger Delta since drilling began in 1958. Cleanups have been halfhearted, and compensation has been paltry. The Nigerian government estimates that 7,000 "spills," large and small, occurred between 1970 and 2000. Locals complain of sore eyes, breathing problems, and lesions on their skin. It’s sickening stuff: a 2009 Amnesty International report found many have lost basic human rights—health, access to food, clean water, and an ability to work. Today about 2,000 oil-polluted sites still need cleaning up. There are many reasons this has occurred: sabotage, faulty equipment, corroded infrastructure. The regulations are weak, rarely enforced, and there are few punitive measures to ensure that spills are managed, monitored, and cleaned up. The oil companies are, effectively, asked to self-regulate. The new Nigerian president, aptly named Goodluck Jonathan, has promised to hold them accountable, but the regulatory agencies are toothless, weakened by decades of rule by corrupt dictators who acted in concert with oil companies and siphoned off much of the oil wealth (80 percent of the state’s revenue comes from oil). The money that has come from oil drilling in Nigeria—$600 billion so far—has gone to very few; most Nigerians live in extreme poverty. So this has been happening, in Africa, for decades, as our motors purr and air conditioners hum, and we have barely blinked. As Prof. Rebecca Bratspies from CUNY School of Law says, "Problems associated with oil production are usually invisible to those of us who consume vast quantities. We don’t see how dirty it is. [The gulf] is a more extreme version of daily events in Nigeria, where the oil companies have had a complete and total disregard for the environmental implications of their actions." Obama asked that $20 billion be set aside to cover cleanup costs in the gulf. Will it be enough? How much would companies like Shell and ExxonMobil have to pay if Africa were well regulated and proper compensation demanded for the loss of livelihoods, illness, and damage to the environment? This is the perfect time to assess oil-industry practices. America should lead a push to ensure global scrutiny and monitoring of oil drilling, on- and offshore. It’s messy and will never be entirely safe, but why should we accept different standards for countries with less money and clout? Global companies should develop adequate global response and compensation mechanisms. One simple but clever idea from Bratspies is that we, through worldwide coordination, ensure that oil companies cannot drill unless they have the proven technology and capacity to respond to leaks, saboteurs, and explosions. If we made it a requirement, it would lead to a "tremendous spur in innovation in clean-up technology." That’s something every country would benefit from, rich or poor. Julia Baird is a Deputy Editor of Newsweek. Follow her on Twitter at http://twitter.com/bairdnewsweek. Federal Republic of Nigeria and People’s Republic of China signed memorandum of understanding - for China to finance and build $23 billion oil refineries in Nigeria. The deal was signed between the state-owned Nigerian National Petroleum Corporation (NNPC) and its Chinese counterpart China State Construction Engineering Corporation Limited for the construction of oil refineries in three strategic centers in Nigeria including Lagos and in troubled Niger Delta. At optimum production the refining capacity is expected to be 750,000 barrels daily. His Excellency Emmanuel Egbogah, The special adviser to the president of Nigeria on petroleum matters and a powerful member of the negotiation team confirmed the signing of the deal to Financial Times of London. It was reported by Financial Times that Dr. Egbogah said that signing of the memorandum of understanding “is a starting point but it's a serious proposal." This is sunshine deal for the investment is in the core needed-area in Nigeria. A win-win deal for everybody, China will get what she wants - the rights for oil exploration while Nigeria will ameliorate her energy problems. *Seven co-operation agreements were signed by Nigeria and China during President Hu 's visit. *China National Petroleum acquired right for oil exploration blocks - comprise two areas in the oil-producing Niger Delta - one onshore and one in shallow water - and two areas in the higher-risk inland Chad basin, where no oil is produced at present. Therefore the oil refineries constructions deal with Nigeria goes along with China strategic and calculative business ventures in Africa and Nigeria in particular. For this significant business deal in Nigeria, China in spite of her ambition in Africa deserves praise. Nigerian economy needs the boost from functioning oil refineries.